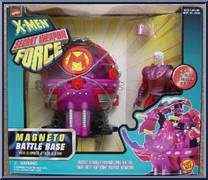 Concealed within an extraordinary-looking piece of machinery is Magneto in his surprise attack battle base! 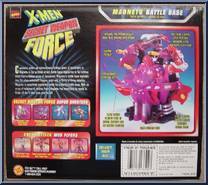 Appearing to be nothing more than a lifeless piece of equipment, Magneto’s battle base explodes into life when activated! Popping open with a flurry of firing missiles, Magneto is completely protected inside his powerful battle base. With an array of weapons to choose from, Magneto has everything he needs to finish off the X-Men once and for all!